A ghost haunts the halls of Stafford House. When Raine Brinsley arrives and accepts a position as a house servant, the ghost is determined to let Raine know who murdered her. Derek and Lyman Stafford race against time to produce the first male heir to secure the title to Stafford House. The brothers will do anything to win...including murder. A dark, gothic novel with romance, mystery, suspense and thrills. * * * "I applauded Raine for her strength in the face of her parents' deaths, especially during a time where women were seen as needing constant protection. Her determination not to accept Derek's charity was admirable, as was her willingness to tackle any job assigned. Although a strong woman, her gentleness is demonstrated in her concern for the spirit and her attempts to understand its message. This story has everything and then some - romance, birth, death, voodoo, adventure, psychic ability, and a touch of Civil War - and I could not put it down. Keta Diablo has once again done a wonderful job of involving the reader in the lives of her characters, and I highly recommend this book." Five Stars, Goodreads Reader "This is a wonderful paranormal romance, which quickly picked up speed as the story progressed. The spiritual undercurrents in the novel are interwoven into the plot with the skill of a great author. Will Lucinda find her revenge? Will the young lovers be reunited in triumph and love? Ah, but what kind of Scot would I be if I told ye the end afore ye gazed upon the first page? We Scots are rather in tune with the paranormal anyway. 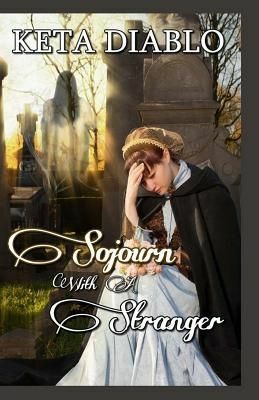 I enjoyed reading Sojourn by Ms. Diablo. I was hooked the moment I saw the cover, but you got me by the second page. Well done " Book Marketing Network, Five Stars "Both hero and heroine had some issues they had to overcome, but I felt more for Derek. He was the one who truly overcame his personal challenges to become a better person. As a groveler, he gets an above average mark. His angst made my day. That added to the intricate plot the author designed and the crooked path to happiness Raine and Derek must travel made this a much enjoyed read." Night Owl Reviews. Four Stars.